I love my little round wooden coffee table. I had been searching for one for ages when I found this one at a yard sale 2 years ago and knew it was coming home with me. This is how it originally looked (back when we still had our black leather lounges). White and chippy. And we used it like this for a while, until I decided it was "restyle time". The dark top was too dark and made the table look small. So I decided to repaint the top white again. But the white was showing all the kids texta marks, so, yep, you guessed it, I changed it again. This time I sanded all the paint off the top, including the stain beneath. It took about 3 hours over two days with my rotary hand sander and left a lot of ripples in the wood. Not the best look, but after so much sanding I was over it. But those ripples bothered me. A lot. Then a few weeks ago hubby suggested I purchase a belt sander to level the table and take out all the grooves. 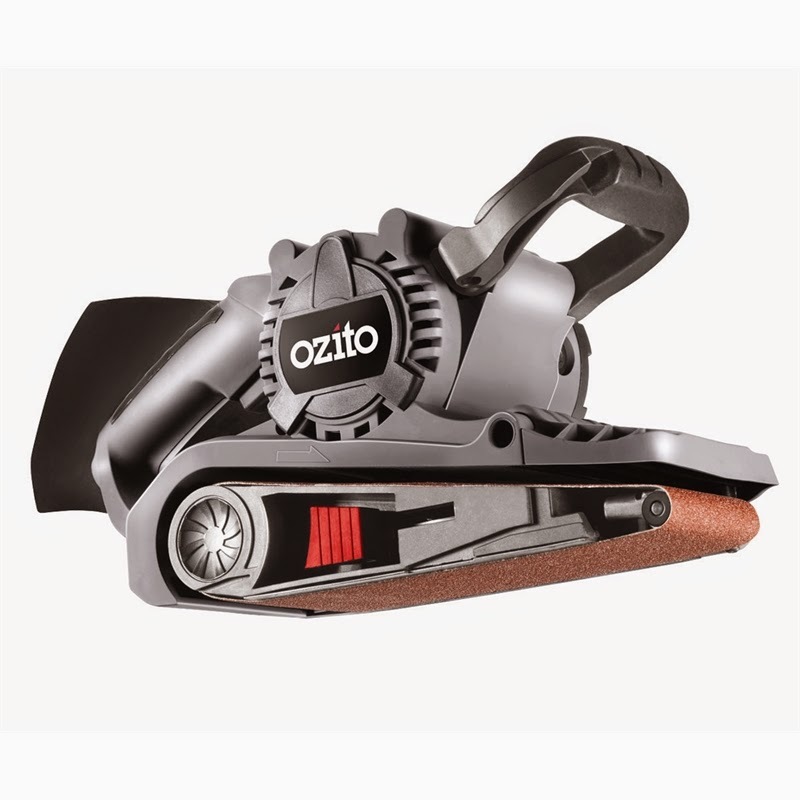 We went to Bunnings and got an Ozito Belt Sander. It is at the cheaper end of the sanders, but for a first timer, I didn't want to spend too much. Yesterday we unpacked it and gave it a whirl. Wow!! This is totally my new favourite tool! Those grooves were gone in less than 20 minutes. A vast improvement on the 3 hours it took me to make them. I know this sander is going to be an absolute time saver for me and well worth the investment. So back to my coffee table. After sanding it down with 80 grit, then 120 grit, then 240 grit, it was ready to clear varnish. I had to build up a few coats to get the coverage I wanted but I couldn't be happier with the result. There are a few very minimal grooves but none that jump out enough to bother me. 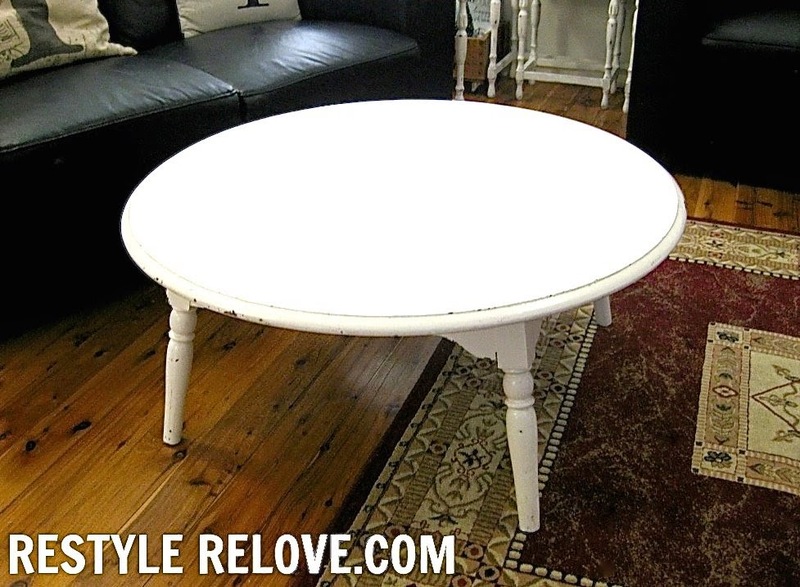 But the real reason I am sharing this coffee table restyle with you now is that I have found a new coffee table for our lounge room which I will be sharing with you shortly. Love the table Julie-a good sander is a great thing! I love the restyle! Very pretty! 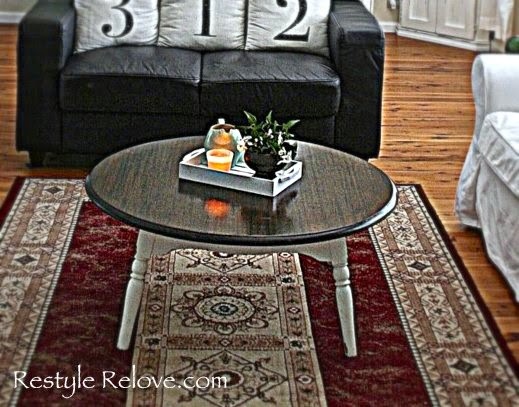 Great re love of this super sweet table. Love this table! Great job. I am jealous of your new sander :) Your coffee table is adorable...I change favorite pieces all the time too. The table is gorgeous. Good job! Love the look of your table! I just really enjoy a round table as they can hold so many things and still look great. Awesome job! I love working with power tools and am a bit jealous of your belt sander! love the table . . . love the number pillows . . . love the ladder . . . love your style . . . I really like your table and you've restyled it! Love your rug too.